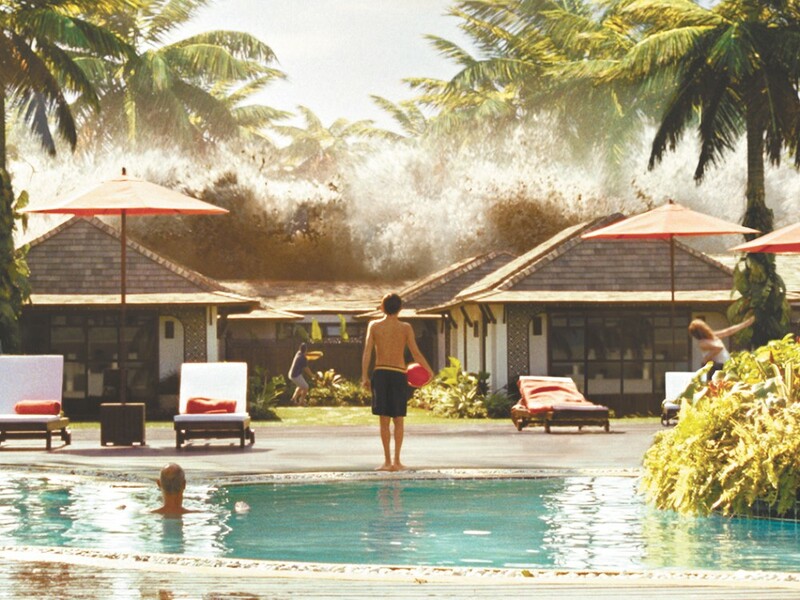 Yes, Eastwood’s Hereafter began, like The Impossible, with a horrific recreation of the Indian Ocean tidal wave that swept through Indonesia on Boxing Day of 2004. Hereafter then splintered off into tales of life after death and spirituality, but The Impossible stays put, telling the story of what happened to one family that had the bad luck to be vacationing right at that devastating act of God’s ground zero. We’re with mom, dad and their three kids on their turbulent plane ride into Thailand during their happy Christmas together, and as they loll about with other vacationers on the beautiful, sunny morning of Dec. 26. Then the power goes out, and the wind picks up, and the rain starts, and the birds fly away... and there’s an otherworldly noise. Enter the visual effects team and its wall of brown water, taking out everyone and everything in its path. I wasn’t looking at my watch while the exhilarating, terrifying sequence played out, as I couldn’t even think about glancing away from the screen, so I have no idea how long it lasted, though it seemed breath-holdingly endless. But moments after a now-creepy calm was restored, and the cameras peered around at an Oscar-worthy example of mass destruction production design, the film was reformatted into a story of a family that’s been physically torn apart and emotionally beaten down, of people who are struggling to survive while trying to focus on a glint of hope that other members are still alive and they will be reunited. Naomi Watts goes for and attains new acting heights in that she’s onscreen a lot, but does far more silent emoting (after plenty of initial screaming) than delivering lines of dialogue. The only reason Ewan McGregor, as her husband, is slightly less effective, is that he has much less screentime. But the standout performance goes to young Tom Holland, as their son Lucas, who practically morphs into manhood as he’s forced to take charge in a situation no one could be ready for. A couple of cliché-like gaffes pop up a couple of times, but they hardly make a dent on one of the biggest, most searing and dramatic films of the year.